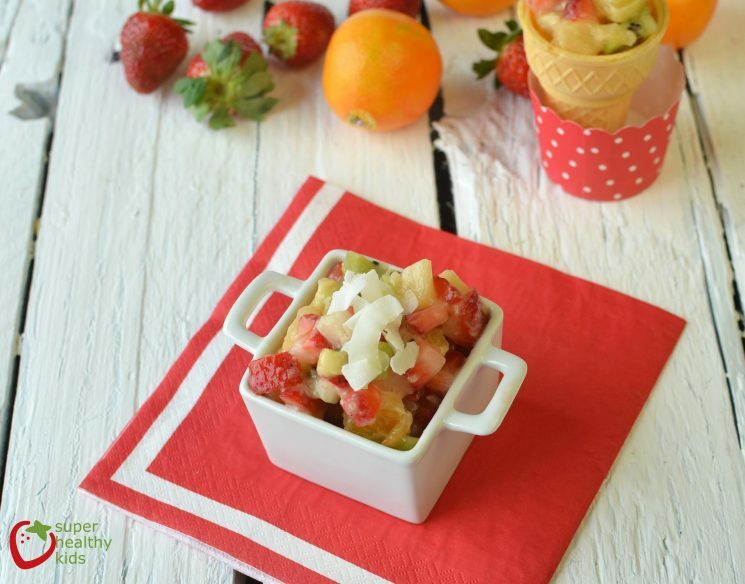 We make fruit salad a lot! Even when we have nothing else to eat in the house, we can usually find some leftover fruit, some frozen or even canned fruit! 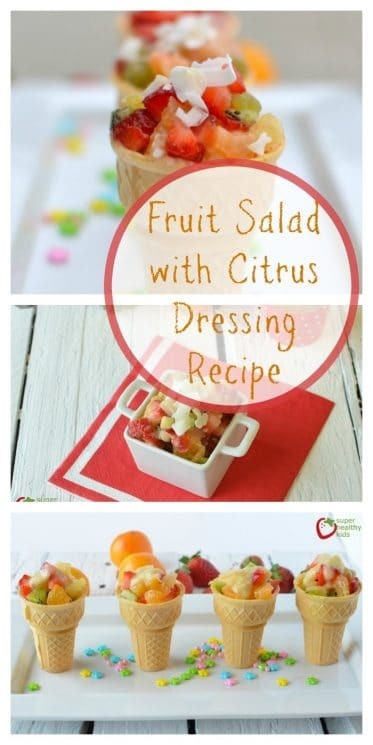 But once in a while, we’ll make some citrus dressing using this recipe, and then pour it on the fruit salad! It’s always a hit when we bring it to potlucks! 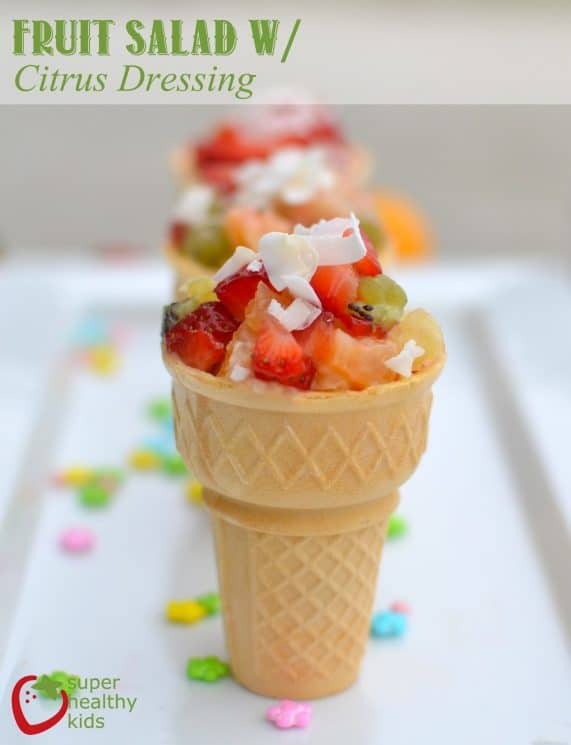 Here’s our Fruit Salad with Citrus Dressing Recipe. We defrosted a few strawberries, sliced some Oranges, and kiwi. We blended up all the dressing ingredients (including the banana) in a blender or food processor and poured it over our fruit. It was really delicious. It made a perfect dressing. By pureeing it less and leaving it a little chunky, it could also be used as a fruit dip. I almost didn’t let my kids have some of this because I liked it so much. But since I want them to eat more fruit, I gave in. Cut strawberries, kiwi, slice oranges, and pineapple. Mix together in a bowl. In a food processor, blend banana, coconut milk, orange slices, and vanilla extract. Thanks for this recipe!! I feel like you wrote this specifically for my family, although we are strangers in real life! My kids go completely gaga over a can of madarin oranges, which is what they ate for a bedtime snack last night. And canned pineapple?? I buy it like crazy! Add some frozen berries and they are over the moon. I’ll definitely be making this dressing soon. I am totally going to try this. YUM! And, I only buy Granny’s wheat bread at Costco since you mentioned it here. You give good tips, so keep it up! The more specific, the better. Karen, I guess our kids would get along great. Every time mandarin oranges go on sale for 0.33 per can, I literally buy dozens. Beth, thanks for taking my advice once and a while. Melissa; Its tough to keep those in stock when they love them. You can only buy enough to not go bad, but then they eat them so fast you are out right away. I can never get it right. Yum, yum, yum! My son hates bananas (he was allergic as an infant), but my daughter and I love them. 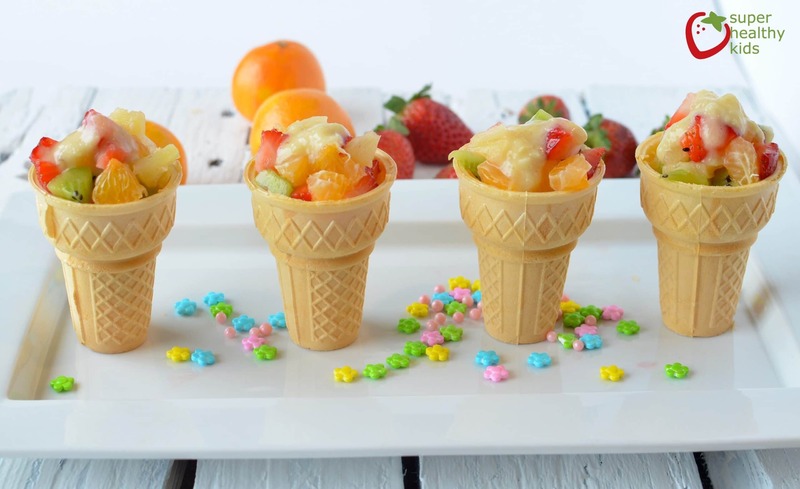 This looks like a great way to do fruit salad, and I’ll be trying this soon! What could be an alternative to bananas for the sauce? I can’t stand bananas. You could leave it out, but it would be quite runny. The banana taste isn’t that strong though. great idea, they look nutritious and delicious! Could cut the dressing in half. 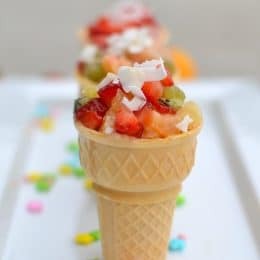 Very pretty though and serving them in the cake cones was fun! Adding some coconut or nuts would be good also.